Go slow, and you might get to tangle with a nice largemouth bass this month before many anglers know it’s possible. I know a lot of fishermen who miss out on February, but it’s a great month in the Carolinas to get your bass boat out on the lake and chase green fish. 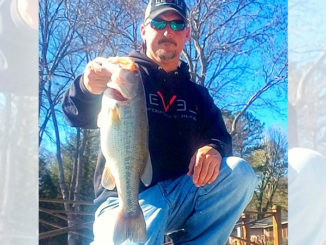 In North Carolina and South Carolina, February is a prespawn month, and depending on the weather, the fishing can be really good or really bad. During warm spells, it can be great. This time of year, fish are starting to come up and stage. Regardless of the weather, they’ll be in 10 feet of water or less, and they’re going to be close to some deep water: on a sharp break, a deep bank or a sharp-breaking point. 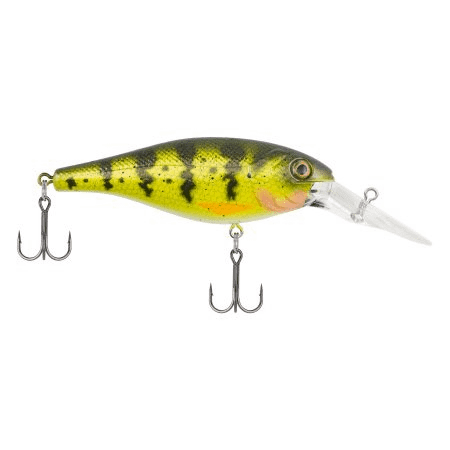 You’re looking for rocks or riprap, and the perfect spot would be one where you can be sitting in your boat in 20 feet of water, casting to the bank. That is a good pattern to fish. The other thing you need to look for, especially if the water is cold — under 50 degrees — is the clearest water around. Dirty, cold water is not where you want to be. Those two don’t go together with good fishing. I usually start out on the lower to middle section of a lake. Most of the fish will be up in the creeks. A lot of fish winter on the main lake, but a lot winter in the creeks in deep water. 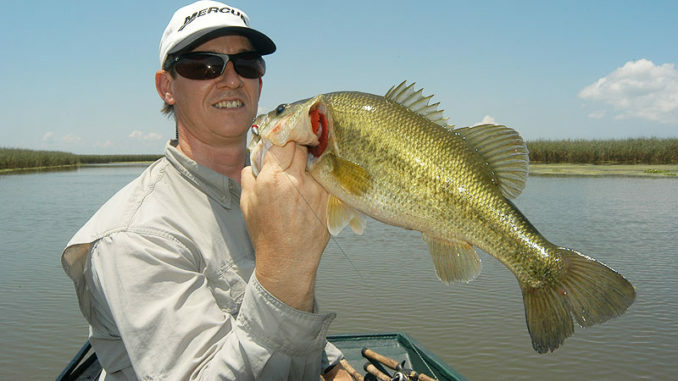 You can normally catch fish in February from the mouth back to where it starts to shallow up. When March comes, they’ll move back and spread out and get on secondary stuff. You can also catch them on the main-lake, usually on main-lake points, channel swings and riprap. 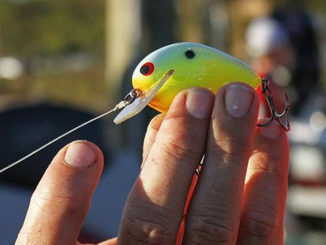 There are three main tools you’re going to use to catch these fish: a crankbait, a jerkbait and a lipless bait. You’re going to fish them as slowly as possible. And I can’t overstate exactly how slowly your retrieve needs to be. I fish these baits on my 6-foot-8, Lews David Fritts Perfect Crankbait Rod and a Lews BB1 reel with a 5.1-to-1 gear ratio. That reel gets back only 21 inches of line with each turn of the handle. 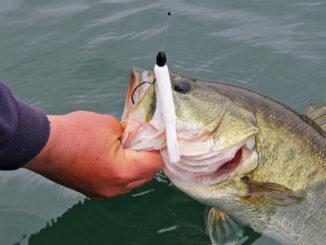 That’s very, very important in cold water, because bass are so sluggish, but they’ll still bite if they don’t have to chase. It’s difficult to get your retrieve slow enough with a faster reel, even with a 6.4-to-1 or 6.8-to-1 reel; it’s hard to slow down enough. February is one of my favorite months, but you won’t be seeing bass on your electronics because they’re usually so tight to cover. You just have to find them on some real abrupt drops. They will get on a river-channel swing or a riprap bank with a dropoff. You won’t find them on flat points — that’s later in the spring. 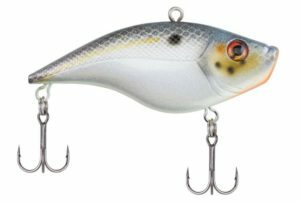 I’m going to throw these baits: a Bad Shad, a Digger 8.5 — those are Berkley crankbaits — then a 110 Cutter jerkbait and a 1/2- or 3/4-ounce Warpig, which is a lipless bait. Except for the Warpig, the colder the water, the slower you need to retrieve them. With the War Pig, you wind it back as hard as you can, especially if the water is warmer. If the water is below 50 degrees, I’ll fish a No. 5 Bad Shad; if it’s above 50, I’ll fish a No. 7. Everything I throw is going to be crawfish-colored. These fish will be ganged up, so when you find ’em, you have a chance to catch more than one. But you have to find them, and part of that is making plenty of casts to a good-looking spot, and especially making them from different angles. It’s difficult sometimes to figure out which way these fish are positioning on a dropoff. A lot of times, the angle of your cast will make a big difference. 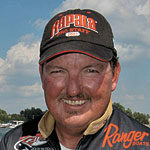 I can remember going down a riprap bank one day and not catching a thing, then turning around and coming down the same bank and catching four — just because I was throwing and retrieving in a different direction. Make sure you make casts from different directions when you go down a bank or around a point. 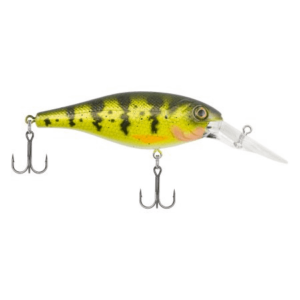 One other thing is, when fishing the Cutter or any other jerkbait, you need it to suspended longer between jerks. One thing that helps is fishing with fluorocarbon; the line is a little heavier and will help the bait suspended longer. Most of the time, I’m spooling up with 10-pound Sensation or Trilene. On the smaller baits, you may get by with 8-pound. So don’t let the calendar saying it’s February scare you into staying home when you get a pretty day or two. The bass are out there; they still have to eat, and they might just want to eat a lure you put in front of them.